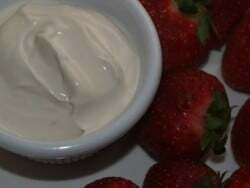 Home » Copycat Restaurant Recipes » Jason’s Deli Creamy Liqueur Fruit Dipping Sauce – you can make your fresh fruit extra special with this recipe. Jason’s Deli Creamy Liqueur Fruit Dipping Sauce – you can make your fresh fruit extra special with this recipe. Jason’s Deli Fruit dip can be served with with fresh cut fruit and you have a delicious snack. Jason’s Fruit Dip stays fresh for about a week in the refrigerator, so this dip will stay fresh for awhile. We are sure you will want to enjoy more fruit with this quick and easy recipe for Jason’s Deli Fruit Dip. Make Jason's Fruit dip with this copycat recipe. Whisk together all ingredients in a medium bowl until sugar is dissolved. Chill for an hour, then stir once before serving. Recovering alcoholic….what can be substituted for liqueur? Maybe some vanilla extract, normally I would say rum, but I wouldn’t suggest anything that tastes like alcohol. I really liked the sauce. omg…I love this fruit dip…best ever! Grand Marnier is a brand of triple sec. They’re the same thing. You can also use Cointreau. is this the dipping sauce with the California club?If yes, what type of sour cream preferred. I would use a natural sour cream. Is the question a brand name or something else. Sour cream, from a brand perspective .. I like Daisy brand, because it doesn’t have thickeners that other products have inside of them. can it be any type of sour cream?